Wives never learn, they keep inviting ‘friends’ to their matrimonial homes! BETTY and Nike were school mates. Four years Nike’s senior, Betty took her under her wings as a ‘school mother.’ “So, what time we actually had together when we were in school was only two years but we were fairly close,” Betty told me at one of our chin-wag sessions recently. “Nike did every chore for me—washed my clothes, fetched my meals when I wasn’t up to eating in the dinning hall and plaited my hair all the time. In return, I protected her from the wrath of some of the seniors, as she was often rude and argumentative. “We got in touch after I finished secondary school and when I got married years later, she was one of my brides’ maids. She got married a few years after I did to a man who was irresponsible from the start. He got her pregnant but denied paternity, insisting his marrying her would be based on the result of a blood test. When the baby girl arrived, he suddenly changed his mind, married her and they went on to have two more children. Then he kicked her out when he found a more interesting woman. “I saw the break-up coming but Nike was in love with the lout. When he kicked her out, she had nowhere to go and I suggested she moved her things and children to our boy’s quarters pending when she would find alternate accommodation. She had a good job and her husband had promised to help towards the finances of re-setting her and their children. So, I agreed for her to move in. ‘As long as she doesn’t get under our feet,’ my husband growled when I sort his consent. ‘She’s a bit too boisterous for my liking. “She was a very ‘good house guest and my children took her kids in their wings. She was always cooking mouth-watering dishes that I seldom had time to prepare, on top of which she managed to look good most of the time. In fairness to her, she made me take more care of my appearance at home as Martin, my husband seemed to relish the attention of two women. Once in a while, Nike spent the evening with us until one day, I noticed Martin sitting with her on the sofa. As the evening wore-on, I noticed Martin sitting far, too close to her. I didn’t take it seriously. He was just playing, so I rolled my eyes and hoped she wasn’t getting the wrong message. A few days later, she was openly flirting with him, telling me how lucky I was to have such a lovely man: compared to the thug she married. 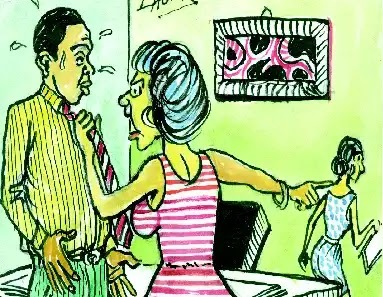 “She was getting too fresh, but short of showing uncalled for jealousy, I had no way of putting an end to her flirting with my husband. I was now witnessing new side of Nike. Had I been wise to invite her to my matrimonial home? to visit at the hospital and Nike was the one who actually brought me home as she said it was easier for her to take time off work than for Martin. “She was silent for a while, pretending to look contrite before blurting out that: ‘I didn’t want to do it, but your husband made me.’ I asked her to pack her things immediately and leave, but she started weeping profusely. When Martin came home and I told him I knew, he confessed it was Nike who made a play for him. ‘She told me she loved me,he said. ‘It just happen.’ When I told him I’d asked her to move out, he said I shouldn’t be hasty. That I should let her find a place to move to first, so that tongues wouldn’t start wagging. “I was unsure of what to do. On the other hand, I didn’t want the tramp near my family. On the other, why should it be me that would suffer when I hadn’t done anything wrong? How could I keep this woman I’d brought into my home away from my husband? That evening I told Nike that she had four weeks to leave. In the interim, she should stay away from my family. She agreed, pleading with me again to forgive her. I watched her like a hawk afterwards. She moved before the four weeks I gave her was up and I heaved a sigh of relief. “Martin had already bounced back from his remorseful self. Life was back to normal. But for only a while. One of the estate agents Nike used to get her flat called at the house to tell me the cheque my husband issued to cover the legal fees bounced. I wasn’t really surprised. I kind of suspected that, now they weren’t under my nose. “Martin and Nike might carry on their disgusting affair behind my back. But for him to be financially responsible for her new flat was just too much for me. nothing. The next week, I went to see her husband and told him what happened. He felt sorry for me. ‘Just ignore her,’he advised,’ she would soon show her true colour. When we were married, she was sleeping with a co-tenant for years, and cooking for him until he got married. Ask no questions, they say, and you’ll be told no lies. I’ve carried on as before and I have no way of knowing if the affair is still on and I don’t intend to find out. When you hear of cases of men who sleep with close relations and friends of the wives, and sometimes get them pregnant, you think it can never happen to you. Why? Because you’re such a good judge of character? Husbands would stray if they’re meant to. But you kick yourself when you find out you brought poison into your own home.